The Huawei R&D Center is located in the H Zone of Huawei's Bantian Base. It concentrated top software development talents, with more than 2,000 people. In order to meet the employee’s favorites who come from all cities of the country, the Huawei R&D Center will made a variety of dishes according to the different eating habits of its employees, such as Hunan cuisine, Sichuan cuisine, Cantonese cuisine, Jiangsu cuisine, Zhejiang cuisine etc. However, most of these dishes produced a large amount of fume which containing odorous during cooking. As a top domestic enterprise, Huawei provides employees the high-quality living environment. On the other hand, Huawei is committed to support China's sustainable development.an efficient and environmentally friendly fume purification system is adopted to ensure that employees' meals and working environment won’t be affected by fume. Guang Jie Environmental Protection Co., Ltd. is a supplier of fume purifiers and technical support for equipment installation in the installation of this fume purification system. The fume purification system of the staff canteen of the Huawei R&D Center uses the most advanced fume purifier in the world - the electrostatic fume purifier. The fume removal rate of our most purifiers in the market can reach 90%. due to the continuous research and improvement of Gojek team, the removal rate already reached 98.4%, which is the top level in China. 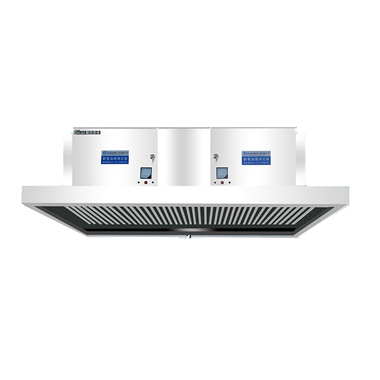 According to the scale of the canteen, our technicians recommend the solution of 6000 air purifier GJESP-600, together with the UV light deodorizer GJUV-600, can completely purify the fume and odor molecules which released during the cooking process.there is no visible smoke in the final exhaust. Completely odorless and no oil can touched. The fume purification system is not only conforms China's catering fume emission regulations, it also meet with the high environmental standards of Shenzhen, and contributes to the environmental protection for Huawei R&D Center and surroundings of Huawei bases.